2016 Kia Sorento Pros and Cons: Why (Not) This Car? The first Kias, cheap and unreliable, made a lasting impression. With no other brand do I so often hear, "I liked the X, but my wife wouldn't be caught dead in one." Those first Kias had a second consequence: they helped plunge the company into bankruptcy back in 1997. Hyundai then acquired a controlling stake. Going forward, the two companies would share body structures, engines, transmissions, and other parts, but would otherwise operate largely independently, like the divisions of General Motors did during its heydey. Continuing negative perceptions and a "little brother" status within the Hyundai Motor Group might have fatally hobbled Kia. Instead, they've inspired it to make the most of the independence it has retained (otherwise it would almost certainly share the fate of Pontiac, Oldsmobile, Mercury, and Plymouth) and to try harder. To take the latest example, compare the redesigned-for-2016 Kia Sorento midsize crossover to the Hyundai Santa Fe. Why the 2016 Kia Sorento? Since it shares all of its basic building blocks with Hyundai, Kia cannot differentiate its cars by offering unique vehicle types (the quirky Soul being an exception) or by offering a more powerful or a more efficient engine. Instead, it has had to focus its competitive efforts on how these shared building blocks are styled and fine-tuned. Kias continue to share no major exterior visible parts with the related Hyundais. For help with its unique surfaces, back in 2006 Kia hired Peter Schreyer, designer of the Bauhaus-inspired, brand-reviving, extraordinarily influential 1998 Audi A6, 2000 Audi TT, and 2002 Audi A4. The resulting Kias have been as tastefully styled as those iconic Audis. The related Hyundais haven't been as artful, while competing Hondas and Toyotas often appear artless in comparison. While designers seem to have little pull within the Japanese companies, Mr. Schreyer has been promoted to the president level of the entire Hyundai Motor Group. True to form, the new Kia Sorento has a tastefully sculpted exterior. Though priced like a Honda Pilot, it looks like it was styled to compete with the Acura MDX. But, like that of the MDX, could the Sorento's surfacing be too subtle? Schreyer got edged out at Audi because executives there felt "more emotional" designs were needed to compete with the ever-more-tortured sheetmetal from Bangle-era BMWs and Mercedes. The new Sorento similarly suffers from Schreyer's restraint. If you study the shape, you'll find it appealing. But nothing about it (with the possible exception of a bold but well short of garish grille) will grab your eye in the first place. The new Sorento's interior makes a more forceful impression. Though as tasteful as the exterior, it includes more striking visual elements such as two-tone upholstery, prominent satin-finished air vents, and an instrument panel that, festooned with stitching and piano black trim, arches from door-to-door like that in a Jaguar--or an Audi A7. There's so much going on that the result could have been a hot mess, but instead it all works. For richer leather, step up from the tested SX to the SX Limited. Unfortunately, this won't upgrade some of the more pedestrian materials inside the Sorento, including the black plastic HVAC controls and the too-obviouly-vinyl, oddly puffy upholstery on the door-mounted armrests. Upgrade these bits, and interior materials would rank among the reasons to buy a Sorento. The Hyundai Santa Fe has equally clean body sides but a less attractive face. Inside, the Santa Fe isn't nearly as easy on the eyes, with a center stack design that tries a bit too hard to look "high-tech." If more recently updated Hyundais are any indication, both the grille and the instrument panel will be replaced by more conventional (and more boring) designs when they are next revised. Kia's "little brother" status has been both a disadvantage and an advantage. Hyundai gets to use any new body structure first. But Kia gets to see what Hyundai does with it, and then has from a few months to a few years to improve on its sibling's effort. There has been considerable room for improvement; more than in any area save brand image, Hyundai and Kia have struggled with suspension tuning. Hyundai introduced the second-generation Santa Fe as a 2007 model. A Kia Sorento based on this Santa Fe didn't arrive until 2011. (The Sorento was previously a truck-based SUV unique to Kia.) Hyundai totally redesigned the Santa Fe for 2013. Kia thoroughly tweaked the Sorento for 2014, adding some of the new Santa Fe's components to the second-gen platform, then totally redesigned it on the third-gen platform for 2016. But Hyundai also reacts quickly to media feedback. For 2015 it revised the Santa Fe's steering and suspension tuning. Despite this recent revision, the new Kia Sorento feels much more polished than the Santa Fe, with a smoother, quieter ride and more naturally weighted steering. Even over severe dips in the road the Kia maintains its composure. Laminated front side windows (on the EX and up) help minimize interior noise levels. In comparison, the Santa Fe feels more jiggly, less fluid, and simply less expensive--even though it's not. Beyond suspension tuning, tires might account for some of the difference. While the Santa Fe wears Kumhos, the Sorento SX is shod with Michelin's latest and greatest performance all-season tire, the Premier. Especially with the SX trims, which get a different type of electric power steering and firmer suspension tuning, Kia has sought to make the Sorento feel sporty. With all trim levels the all-wheel-drive system includes brake-based torque vectoring, to counteract understeer and promote a more balanced feel in hard cornering. But, despite these efforts, the new Sorento SX feels more pleasant and confidence-inspiring than fun. I thoroughly enjoyed the driving experience, but I wasn't thrilled by it. Then again, none of the vehicles in this segment is thrilling to drive. Compared to them, the somewhat more compact Sorento at least feels a little more agile, more balanced, and more composed, so I've listed handling among the reasons to buy one. Interior design isn't only about looking good. Despite offering about as many features as anyone else (a panoramic sunroof, heated-and-cooled front seats, heated rear seats, a heated steering wheel, adaptive cruise control, an around-view camera system, and a full array of collision detection systems), the Sorento's controls are easy to reach, identify at a glance, and operate. One aesthetic lapse: even the nearly top-of-the-line SX has three blanks in a five-button array below the HVAC controls, and the buttons for the seat heaters that are present are not symmetrically located. Why not? The Santa Fe's controls are nearly as good, with one notable exception: it provides a pair of buttons instead of a tuning knob for channel surfers. I made it to the fifth slot before including the top reason for many past Hyundai and Kia purchases: a longer warranty. It's 5/60 "bumper-to-bumper" (with exclusions in the fine print--read it) vs. most others' 3/36 plus 10/100 (original owner only) on the powertrain vs. the others' 5/60. Why Not the 2016 Kia Sorento? The number one reason most people seem to have for not buying a Kia is that it's a Kia. As noted in the introduction, negative brand perceptions linger. Hyundai offers the Santa Fe in two lengths, a two-row 184.6-inch "Sport" and a three-row 193.1-inch regular version. Though the 2011-2015 Sorento had an optional third-row seat, it was about the same length as the Santa Fe Sport. Perhaps to better fit that third-row seat and differentiate itself from the two Hyundai variants, the 2016 Sorento is three inches longer than the 2015, for a total of 187.4. Kia has done a good job packaging the new SUV. Though the Toyota Highlander and (2009-2015) Honda Pilot are considerably longer, their rear seats have no more rear legroom than the new Sorento's. At 5-9, I can just barely fit in any of them. Passengers will have more room to stretch their legs in the Santa Fe, though third-row headroom is similarly limited to people of at most my height. If you need an adult-friendly third-row, you really need a minivan. Kia offers an especially stylish one. Like the Santa Fe, the Sorento falls between others' compact and midsize SUVs in width. There might not be more rear legroom in a Highlander or Pilot, but there's enough additional shoulder room to include a third seating position in the third row. If you need an eight-passenger vehicle, both the Sorento and the Santa Fe are out of contention. At least all trim levels of the Sorento can seat seven people. The Santa Fe Limited can only fit six. In both the Kia and the Hyundai the second-row seat is mounted comfortably high off the floor, not a given among midsize crossovers. The third-row seat is mounted low to the floor, forcing a knees-high seating position, but this is pretty much a given in the class. Given the Sorento's abbreviated length, it should come as no surprise that scanty space for cargo remains behind its third-row seat. Sure, volume has increased by 24 percent over the even less lengthy 2011-2015 Sorento, but still to only 11.3 cubic feet. This is enough for a row of grocery bags or a couple pieces of medium-sized luggage, but not much else. Competitors, including the Santa Fe, offer at least a couple more cubic feet. Ford's Explorer and Flex, with their deep well behind the third row, reign here. But if you need plenty of space for people AND cargo, once again you really need a minivan. The 2016 Kia Sorento is available with three different engines. The L and LX receive adequate performance from a 185-horsepower 2.4-liter four-cylinder engine (based on a drive in the related, similarly hefty Hyundai Santa Fe Sport). The EX and SX feel considerably stronger thanks to a 240-horsepower turbocharged 2.0-liter four-cylinder engine. Beyond the advantage suggested by its higher peak horsepower stat, the turbocharged engine has a much stouter midrange, so there's much less need to rev it in daily driving. That said, if past experience with earlier iterations of this engine is any guide its power delivery is not the smoothest, with some surging and lulling at part throttle. For smooth, strong power, the best alternative is clearly the 290-horsepower 3.3-liter V6 available with the LX, EX, SX, and SX Limited trim levels. The V6 is only about a half-second quicker from a dead stop to 60 mph (figure high sevens vs. low eights), but it sounds and feels much better. The V6 also has a higher towing capacity, 5,000 vs. 3,500 lbs. The Santa Fe has the same V6 engine, and weighs about the same, so its performance is similar. The Toyota Highlander has a larger, 3.5-liter engine that, while not as strong near the redline (based on its 270-horsepower spec), is stronger at moderate rpm. But the Toyota also happens to be about 300 pounds heavier, so its performance is also similar. In qualitative terms, the Highlander has a bit of an edge. As smooth and refined as the Sorento's V6 powertrain is, the Toyota's is even smoother and even more refined. Fuel economy isn't outstanding with any of the 2016 Kia Sorento's powertrain options. The base four with front-wheel drive earns the highest marks, but its 21 mph city, 29 mpg highway are well short of the latest compact crossovers. Add all-wheel drive and even the base engine's highway figure falls to 26, the same as the V6. Many manufacturers have been shifting from V6s to turbocharged fours for the allegedly superior efficiency of the latter. In the case of the 2016 Sorento, though, the fuel economy advantage of the turbo four is far from apparent, especially with all-wheel drive, where the turbo four scores 19/25 and the V6 scores 18/26. The last figure is pretty good for a V6 in a three-row crossover--the Highlander rates 18/24, the 2016 Honda Pilot 18/26 or 19/26, depending on trim level--but remember that the Sorento is smaller than the others. The real mystery: since it doesn't get better fuel economy, why bother with the turbocharged four? It does cost $600 less than the V6, but with the EX and up the V6 includes the third-row seat, which costs $1,000 as a separate option on the LX V6. Do the math, and Kia is charging $400 extra for the weaker, less refined performance of the turbocharged engine. This doesn't strike me as a good deal. The new Sorento has earned good crash test scores. I haven't included safety among the reasons to buy one because forward collision warning is only offered as an option on the top trim level and automatic braking is not available. The new Honda Pilot offers a full array of safety features on all but its lowest trim level. Also, the Sorento's side curtain airbags do not appear to cover its third row. The side curtain airbags do cover the third row in the Santa Fe. But the Hyundai doesn't offer forward collision warning and barely passed the challenging "small overlap" front crash test. It might not be obvious from looking at the photos, but the new body structure includes a more car-like driving position. That in the 2011-2015 Sorento and the 2007-2012 Santa Fe was higher and more upright, which made them feel more truck-like and dated. Even with the 2016's lower driving position outward visibility remains good. The SX trim level adds a vertical adjustment to the power lumbar and a power cushion length adjuster to the driver seat. With these additional adjustments, it should be possible to tailor the driver seat to fit just about anybody. It fit me well, but I'm pretty easy as long as the headrest doesn't jut too far forward (it doesn't). Yet the styling of the Sorento's interior led me to expect an even more comfortable driver seat. While the seat is cushier than that in the Santa Fe, I felt it could feel even more form-fitting and luxurious. As it stands, the driver seat is very good but not great. The front passenger seat has no lumbar adjustment, but does have power adjustments for height and tilt as well as fore-aft and recline. The first two adjustments are rare among the passenger seats of Japanese vehicles in this price range--you won't find them on the Highlander or the Pilot. In the past, Kias were much cheaper than Hondas and Toyotas, and even somewhat cheaper than Hyundais. However, as its cars have improved their prices have increased. A fully-loaded 2016 Kia Sorento SX Limited lists for $46,495, about even with a 2015 Toyota Highlander Limited Platinum after quantifiable feature differences are accounted for. To be fair, the top-trim Sorento has much nicer leather than you'll find inside any direct competitor. Drop down to the tested non-L SX for commensurate leather, and lose the Technology Package (adaptive cruise, lane departure warning, around-view cameras) along with xenon headlights, ventilated front seats, heated steering wheel, and heated rear seats, and the bottom line drops by $6,000, to just over 40k. (You can save another $650 by opting for the Sorento EX V6, but in my opinion the SX's appearance and performance enhancements plus additional driver seat adjustments are easily worth that much.) The Highlander XLE is similarly priced, but the Highlander Limited and Limited Platinum check in about $2k higher even after adjusting for their additional features. The Hyundai Santa Fe is also about the same price, as is the 2016 Honda Pilot. But these comparisons involve sticker prices. Honda and Toyota dealers enjoy much larger margins than Kia dealers, so invoice-to-invoice the Highlander and Pilot can come out as much as $2,600 lower. Look beyond purchase price to total cost of ownership, and much less rapid depreciation plus its newly available safety features make the new Pilot the clear value choice in the segment. Don't need the V6 engine or the third-row seat? The 2016 Sorento L lists for $25,795, but it doesn't really compete with the Santa Fe, Highlander, and Pilot. Instead, it more directly compares with the half-size-smaller, about $1,000 less expensive Toyota RAV4 and Honda CR-V. The Kia Sorento and Hyundai Santa Fe are no longer significantly cheaper than the Honda Pilot and Toyota Highlander. In fact, if you compare invoice prices and factor in depreciation, they'll likely end up with higher total costs. So there had better be reasons to buy them beyond a low price. Between the Santa Fe and the Sorento, the latter is easily the most compelling. The Santa Fe does have more rear seat legroom and cargo room, but its advantages end there. Some people might even want the most compact crossover they can get with V6 power and a third-row seat. For these people, the Sorento is the clear choice. For others who do want plenty of room for passengers and cargo, the Santa Fe does better, but what they really need is a minivan. Beyond the issue of interior space (or the lack of it), Kia has put a lot of effort into design, refinement, and fine-tuning the suspension, and it shows in how the new Sorento looks and rides. The Sorento might not stand out in any measurable way, but it delivers a superior driving experience. I enjoyed driving it more than I did the Santa Fe or the Highlander. Once perceptions fall into line with reality--the new Sorento is a far nicer car than Kia-rejecters expect--there won't be much holding Kia back. The question then: when nothing is holding Kia back, will it keep trying as hard to improve its products? Kia and Toyota each provided insured vehicles with a tank of gas. Jim Cipriano of Feldman Hyundai in Waterford, MI, helpfully provided a Santa Fe for a comparison test drive. He can be reached at 248-599-5923. 2016 Kia Sorento pros and cons, according to Michael Karesh: the best reasons for buying (or not buying) the 2016 Kia Sorento. Join TrueDelta to post your own impressions. I do like the look of this latest Sorento, however the price has crept up too close to the established players to play the value card. The fuel economy also leaves a lot to be desired - Kia & Hyundai need to work on this area as none of their vehicles are leaders in fuel economy. They used to be leaders in the EPA ratings...until they had to revise them downward and send fuel cards to owners. Even so, the Sorento's fuel economy is competitive if not outstanding. As for the price, I said much the same thing in the review--price isn't a key reason to buy the new Sorento. Really intrigued by your comment regarding the different EPA testing methodologies between the SX and above models vs. EX and below with the V-6. How would being in a different weight class impact EPA ratings? A thorough and helpful review. 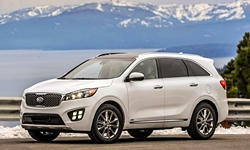 Readers in Canada thinking of a Sorento purchase might be interested to know that the Cdn. EX has many features found on the US higher end models: 14 way drivers seat; power folding and tilting side mirrors; blindspot and cross traffic warning; push button start; heated steering wheel etc. All Cdn. Sorentos are AWD. Have owned the EX with the turbo 4 for a couple of months now, and like it more and more. Almost everything seems very well thought out and well executed. Have not noticed any lagging with the turbo, though the car does jump ahead when you get on the gas, which is what I want it to do. We have two row seating, but the D pillars have "Air Bag" insignias, leading me to think that the side curtains air bags extend back to the hatch. Prior to driving the Sorento, we did a test drive in a Highlander Platinum. Not having driven an SUV before, the Highlander confirmed all my worst suspicions of the type: uncomfortable, ungainly, handling like an ice cream truck. Reluctantly, I continued to the Kia store to drive a Sorento, and was very pleasantly surprised. So much so, we bought the car we tested. I'm owning a EX V6 AWD with panoramic sunroof since June 2015. Very pleased with the vehicle so far which shows lots of improvements from my 2012 it replaces. More comfortable, better insonorisation, better road maner and handling, more responsive AWD system with a recalibrated ESP system that manage engine power instead of cutting all power if it detects slippery condition (at departure of a complete stop on ice by exemple). The improved frame rigidity gives better hauling maners (I have a 3 000lbs boat including trailer weight) and reduces sunroofs squeaks in winter period. For pricing, the invoice price is effectively now closer to competition, but, at least here in Canada, still a couple thousands lower than Japenese and Americans. Over than that, considering most people can't buy "cash", financing options are usually way more competitives with incentives and lower interest rates on newly released model. In June 2015, while taking cost of financing in the total, overall acquisition of a XLE trimed Highlander was around 8 000$ more expensive over a 60 months term ! That's lots of money ! Anyway, it's hard to say that any vehicle in this category is not competitive in a way or another ... there's enough products for every single people taste :-).